The video, which appeared on Sanders’ official Twitter and Facebook accounts, received more than 600,000 combined views. 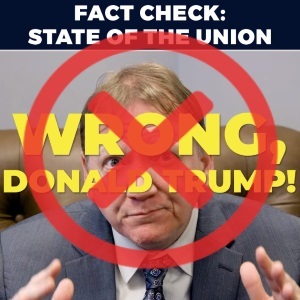 It features Warren Gunnels, the senator’s top aide on the Senate budget committee, “fact-checking” the president’s State of the Union address. Gunnels covers a lot of ground — but we’re going to focus here on his claims involving the unemployment rate for the general population and employment data for those ages 25 to 54. In his State of the Union address, Trump said “unemployment has reached the lowest rate in over half a century.” The official unemployment rate, which was 4 percent in January, dropped as low as 3.7 percent in September and November — marking the first time it had been that low since 1969. “The reality is that the real unemployment rate — which includes those who have given up looking for work and those who are working part time when they need a full-time job — is 8.1 percent, not 4 percent,” Gunnels says. The official unemployment rate represents people who are out of work and actively seeking work in the last four weeks. Gunnels, instead, is referring to the U-6, an “alternative measure of labor underutilization,” which includes the total unemployed, discouraged workers who have stopped looking for work, and part-time workers who cannot find full-time work for economic reasons. Gunnels is right that the U-6 rate was 8.1 percent in January. But this is what he doesn’t tell his viewers: Under Trump, the U-6 rate had dropped to its lowest level in 17 years. When Trump took office, the U-6 rate was 9.3 percent. Since then, it dropped nearly 2 percentage points to a low of 7.4 percent in August 2018. It hadn’t been that low since April 2001. 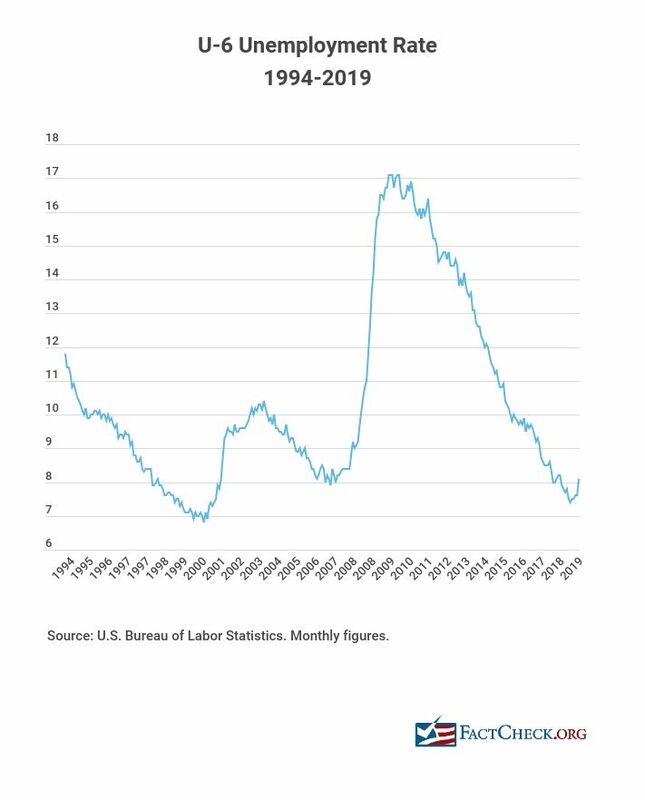 Even the current rate of 8.1 percent is 1.2 percentage points lower than it was when Trump took office and much lower than the monthly average of 10.4 percent since 1994, which is when BLS started to publish this and other alternative measures of labor underutilization. The below chart, based on BLS data, shows how using one data point without any context — as Gunnels did in his “fact-check” video — is misleading. In the video, Gunnels moves directly from the “real” unemployment rate to the number of people working — or rather not working. “And over 20 percent of Americans between the ages of 25-54 do not have a job, which is higher than was the case 19 years ago,” he says. This time Gunnels is cherry-picking data to make a partisan attack. 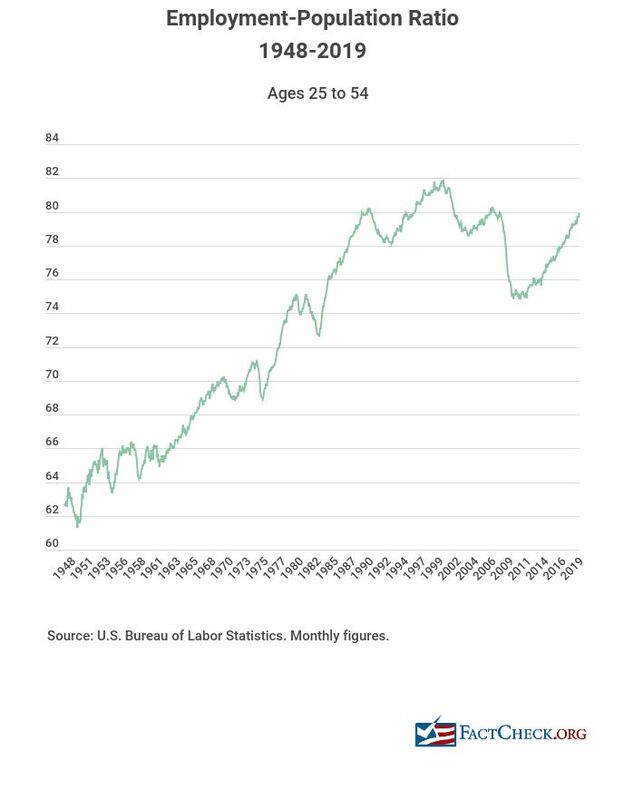 In an email, Gunnels told us: “According to the Bureau of Labor Statistics, the Employment Population Ratio for those between the ages of 25-54 was 79.9 percent in January of 2019 and 81.1 percent in January of 2000.” The employment-population ratio is the percentage of the population that is employed – and, in this case, for workers between the ages of 25 and 54. If 79.9 percent of the 25-to-54 population was working in January, then 20.1 percent was not working. So Gunnels is right about that. But, again, the Sanders “fact-check” video doesn’t tell viewers all of the pertinent facts. The 79.9 percent ratio is the highest in 11 years; it hasn’t been this high since February 2008. The 79.9 percent ratio is 1.7 percentage points higher than it was when Trump took office; it was 78.2 percent when President Barack Obama left office. The 79.9 percent ratio is much higher than the historical average since 1948 of 73.3 percent, and not far behind the peak of 81.9 percent in April 2000. Gunnels takes the position that Trump was “wrong” when the president said the U.S. has “the hottest economy anywhere in the world.” That’s his opinion. But he cannot misrepresent the facts — especially in a “fact-check” video. Yes, the labor figures he uses are accurate, but they leave a skewed impression of the economy under Trump without context. Instead, we invite readers to view our fact-check video of the president’s State of the Union address. "Over 20 percent of Americans between the ages of 25-54 do not have a job, which is higher than was the case 19 years ago."